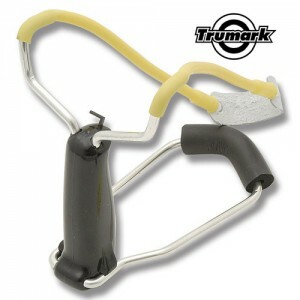 TRUMARK’S FS-1 wrist-braced slingshot folds down to a compact size. The FS Series sling shots FS-1, FSX-2000, and FSXFO are the only folding slingshots manufactured today with an ammo storage chamber inside the handle. If needed, the wrist-brace can be easily removed from the handle, and reinstalled later. Although removing the wrist-brace turns the FS-1 into a non wrist-braced, slingshot, you can still store items in the handle. The handle can store ammo, matches, small knives, or repair kit. 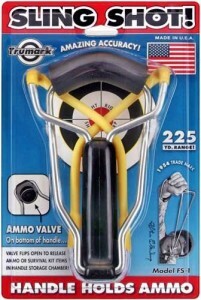 It’s unique bottom valve “flips”open, to dispense 5/16″, 3/8″ or 1/2″ ammo. The hollow handle also keeps the slingshot floating if accidently dropped in the water. 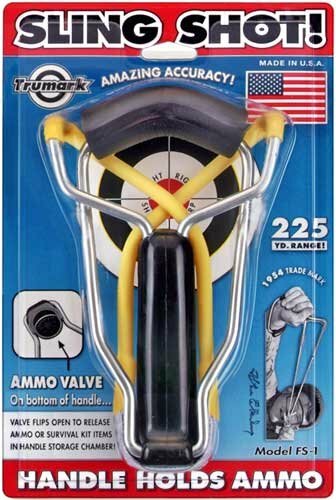 Unlike all other, solid-core-handle, folding slingshots sold today with handles molded in two pieces, Trumark’s handles do not use glue, rivets, or screws to hold them together. They are molded in one complete piece! The wide aluminum forks, with a 4-1/2” spread between the prongs, increases powerband life. The light non-rust aircraft aluminum frame and compact size make the FS-1 slingshot a favorite survival aid for campers, hunters, and backpackers. Powered by matched-pull latex RR-1 powerbands, with a split-chrome leather pouch… 225 yd range! Since I first became interested in prepping for what may come after an apocalypse, I’ve searched high and low for simple weapons that could be used effectively for survival. Aside from having a knife and possibly a firearm on my belt, I felt that any good backup weapon would be the answer to this question: What weapon is silent to operate, can fire a projectile with deadly accuracy at least 25 yards, and weighs less than a pound including ammo? …Anyone answer with a slingshot? Maybe it was the title of the article or the image to the right that give it away. Whether you are going on a short hike or you need to bug out without drawing unnecessary attention, you should have a slingshot packed in your bag. If you become injured or lost and need to hunt for food or defend yourself from a wild animal, having that slingshot could save your life. 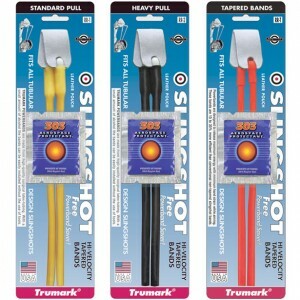 Since 1953, Trumark has manufactured millions of their slingshots right here in the US. Trumark’s FS-1 is their most popular model, so they can be found everywhere. Since I was able to get my hands on one, lets give it a test drive for this article. The FS-1 is a compact, foldable slingshot weighing in at a little less than 5 oz. A perfect size and weight for campers, hunters, and backpackers. Made with a lightweight aircraft-grade aluminum rod, the frame is completely rust-proof. The aluminum forks provide a 4-1/2″ spread between the prongs which will likely increase the life of the powerbands. The FS-1 comes powered by matched-pull latex RR-1 powerbands, with a split-chrome leather pouch. Both left and right bands are cut from a single-length of tubing so that they are “matched” (balanced) for more accurate shooting. As an alternative to Trumark’s RR-1 “normal-pull” powerbands, you can easily replace them with Trumark’s RR-2 “heavy-pull” powerbands and Trumark’s RR-T high-efficiency tapered bands. With a small amount of rubbing alcohol, the bands can easily be installed on any brand of slingshot with round prongs, without the use of tools, strings, or glue. Trumark’s RR-1 powerbands are made from high quality, surgical “continuously dipped” (not extruded) latex-tubing. Trumark’s RR-1 powerbands can reach a velocity up to 232 ft/sec, with a range as high as 225 yards. Trumark’s RR-2 powerbands are made from the best quality, pure latex-rubber. A 0.4% carbon black jacket has been added to the rubber for the ultimate protection against damaging Ulraviolet light rays. (Adding black carbon is a method proven to prevent premature aging of rubber which has been used in the tire industry for over 100 years!) The black carbon helps make them the most durable slingshot bands ever. 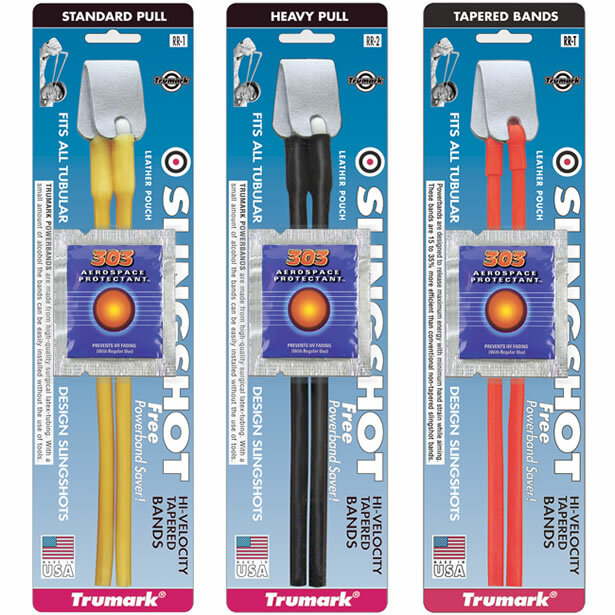 Trumark’s RR-T tapered bands improves the operating efficiency of slingshots. Easier to pull back to shooting position than normal-pull bands, tapered bands are designed to release maximum energy with minimum arm and hand strain while aiming and shooting. These sling shot powerbands are 15 to 35% more efficient than standard non tapered bands. They are excellent for tournament shooting where faster ammo velocity and accuracy help you increase scores. All Trumark bands may be conditioned regularly with Trumark’s 303 Aerospace Protectant to protect them against contaminating elements. Conditioned bands have increased lifespan and a minimized loss of power over time. The FS-1 has a durable, one-piece ABS plastic handle with a patented snap-open storage compartment perfect for storing ammo, waterproof matches, ferro rod, small knife, or a fishing kit. The molded handle is free from glues, rivets, and screws holding it together. Since the handle is hollow, the FS-1 may stay afloat if dropped into water. The obvious negative here is when the compartment is not completely full, the items may tend to rattle inside. The FS-1 is equipped with a wrist brace made from the same lightweight aircraft-grade aluminum rod as the fork. The wrist brace is foldable and can be removed with ease. The FS-1 includes a soft recoil pad for extra comfort as well. The FS-1 is designed to shoot 1/4″, 5/16″ and 3/8″ steel balls and 1/2″ glass shot. However, you can shoot just about anything that will fit in the pouch from rocks to washers, and even balls of ice. Ammo can be found at most any sporting goods store. However, the quality can differ greatly. Grade A ammo is perfectly round so it centers easily in the pouch, and it is much more accurate. Grade B ammo on the other hand has a “flat spot” typically found on cheaper metal balls which are often used to mix paint in spray cans. Located at the base of the FS-1, there is a hinged-door covering the hidden storage compartment. The door appears to be made from the same durable material as the handle. And if it needs to be replaced, it does appear to be removeable. The foldable wrist brace is locked into place by swinging it around the handle until it locks into the grooves provided. To collapse the slingshot, simply pull the wrist brace around the handle until it is completely folded. To completely remove the wrist brace, simply pull the aluminum rod out of the handle where it is hinged on each side. It can easily be reinstalled by snapping the rod-ends back into the handle. There really isn’t much more to this slingshot beyond how powerful and accurate it is. My FS-1 has the RR-1 bands on it so that it what I’ll be testing with today. My target will be a standard 2′ x 2′ box with a reinforced back-panel. To reinforce the box, I simply attached 4 additional layers of cardboard and a large towel folded into thirds inside the box, against the back panel. This should prevent any ammo from escaping out the back of the box. While I’m not able to pluck a dime out of the air… yet. As I became more comfortable with aiming and releasing the pouch, my accuracy improved quite rapidly. For the first test, I was able to get a grouping down to around 6″ at a distance of about 21′ using some cheap 1/4″ steel slingshot ammo. For my second test, I chose to use the 3/8″ steel slingshot ammo at the same distance of 21′. While I seemed equally as accurate with the 3/8″ ammo, you could hear that the target was hit with a much greater force by the larger ball than with the smaller one. Finally, I tried a 1/2″ glass shot that I had lying around and found that I was much more accurate with that. But I’m sure with more practice, I’ll get even better with all of them. After my initial practice session, I noticed the small plastic tab fixed to the top of the handle had broken off from the pouch and bands hitting it. I am not sure what this tab was for… But it is likely I will not miss it. If you are looking for an affordable slingshot that is easy to use and very accurate, the Trumark FS-1 is a solid contender whether you are young or old. The FS-1 is made from quality materials and extremely durable, but without all of the bells and whistles. It is compact and lightweight enough for backpacking where size and weight can be a great concern. The only real negative that I found with the FS-1 is with the molded handle. The seam where the two halves of the mold came together is not as smooth as it could be. However, the easy fix is to sand down the handle with some medium to fine sandpaper until it is smooth enough for your taste. I also preferred the slight non-slip texture left after sanding which I actually found to be beneficial as I continued to practice. The FS-1 can be found as low as $7.99 making them a great option to have in all of your bug-out and go -bags as well as strategic locations around our home. Perfect for fending off an unwanted guest when you don’t have a firearm handy. Slingshots / catapults manufactured around the world today are still based on the ideas pioneered by Trumark in 1953. Although the original models worked well as wintertime “fort busters”, Trumark evolved the slingshot / catapult into models that could be sold throughout the year. Trumark has manufactured millions of slingshots over the last 55 years, and continues to lead the way forward in slingshot design and development. Trumark designs and creates in Boulder, Colorado, all of the machines and molds “in house” needed to manufacture, package, and ship from our factory the finest quality slingshots possible using skilled workers living in the USA.